One can discuss whether or not the barnacle is the king of Galician marine cuisine; nothing is established about taste. But, undoubtedly, this small crustacean is among the most well-known and revered products of the Community’s cuisine. And that’s considering that preparing them does not present, at least in theory, any difficulty. But what is the best time to consume it? The answer is not easy either. 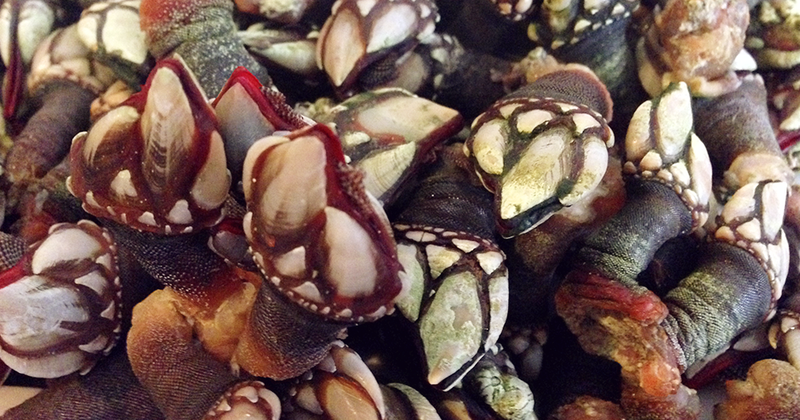 Barnacle can be found in Galician markets and restaurants practically throughout the year. Experts say, as with everything, that the best month to eat it is March, still in the middle of winter. They are also especially tasty at the end of summer, the time on which the main exaltation festivities take place in the towns of Corme and Cedeira, famous for their abrupt coasts and, consequently, for the quality of the barnacle they produce. Another time in which the barnacle is in high demand is December, when it reaches the highest prices. In Christmas time, a classic journalistic piece indicates what a kilo costs in this or that market, usually a high amount… although it is not so much so when you know the circumstances in which it is obtained. This is a hard and risky profession: jumping among the rocks, climbing into and out of a boat, the professionals (in many cases women) travel the part of the coast where the sea fierce to collect barnacles.. It is easy to slip or for a wave higher than expected to make things difficult. They start when the tide begins to recede to gather a few kilos, preferably on the stones where the currents are, in fact, strongest. It is there where the barnacle feeds best, thanks to the abundance of plankton from Galician coastal waters. The cost of barnacles has to do with, in addition to the season, its size. The largest can reach a price of 180€ at the market, and the most valued are those that reach land with a piece of rock still attached. They should have a proportionate shape and be rather thick. The longest, called shadow barnacles, are those that grow under the stones and have less flavor. Because if there’s something that distinguishes Galician barnacles, in addition to their thickness and that they usually grow in compact groups, it is their unique and unmistakable sea flavor. The traditional recipe makes the most of that quality, without adding any form of disguise. “Water boils, barnacles thrown in, water boils, barnacles taken out”, goes the saying, very graphically summarizing the cooking process. There are those who add a bay leaf to this formula and, of course, there is no lack of contemporary chefs who update the classic preparation and introduce this shellfish into more elaborate recipes, accompanying creams or even as garnish for fish. Cooked in sea water, covered with a cloth so they do not get cold, it is delicious to taste them little by little, accompanied by a Galician white wine, for example an albariño or a godello. As for the time of year … the time of year is irrelevant!